I have some wonderful 1950s women's magazines full of vintage recipes. I've been cooking some of them here and there and so far, they've all been a big hit with my family. 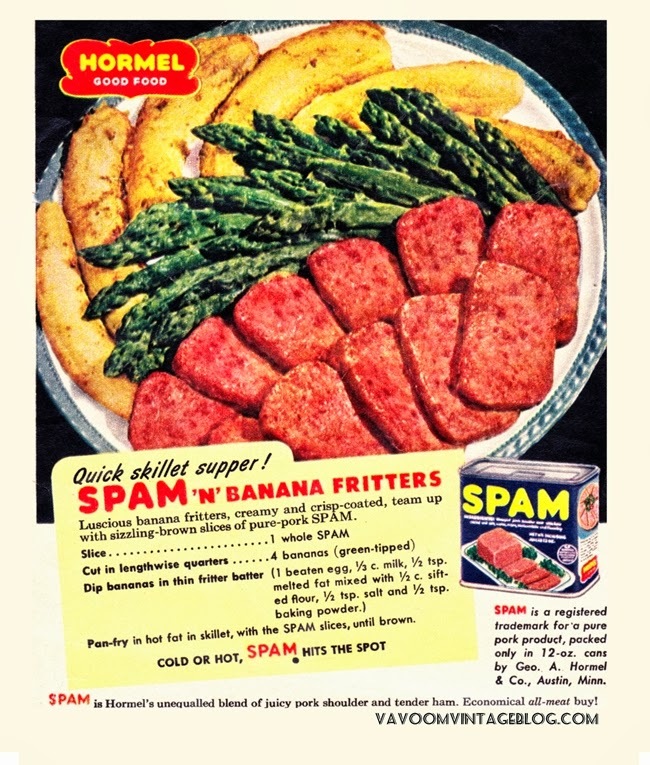 Today, I have a great 50s recipe for Spam and banana fritters. I know- Spam is salty potted mystery meat but, this dish is very good! The sweetness of the banana with the salty Spam is a perfect blend. Pj took one bite and said "Oh wow!" If you've never tried Spam before, this is a very good Spam newbie recipe. The first time I tried Spam, I was a teenager, camping with the neighbors and they made Spam and eggs for breakfast on a grilled tortilla. It was okay...then my grandma made Spam and eggs for me one morning and it was to die for. Grandma grew up in Hawaii in the 40s and 50s so she really knows her canned meat! Spam and other canned meats were a staple for many vintage housewives. Those cute retro fridges don't have a lot of space and some housewives couldn't afford a deep freeze so canned meats were a great option for quick, cheap meals. I put Pj in charge of slicing the bananas and since ours were quite ripe, they didn't slice well. He's a pretty clever fella and figured out that if you slice the banana with the peel still on, they come out really well. We still had to cut them in half because they weren't green-tipped like the recipe called for. Also, a tip for Spam is that it's very greasy and like bacon and will create more grease as it cooks. I drained my pan a bit as I fried these babies so they got nice and brown. If you have a counter top grill like a George Forman, they would probably turn out quite nice! This is a very greasy dish but I always keep a collander next to the stove to drain fried things before plating. Garnish the plate with something green. For breakfast, try sliced green apples, green grapes or spinach leaves for a savory breakfast sandwich. For dinner, try asparagus, crisp green beans or just a sprig of parsley. Have you ever tried Spam? If you cook this recipe, please let me know what you and your family thought! Looks yummy to me! I ate Spam sandwiches when I was a child. No cooking, just straight out of the can and on to the bread with a smear of mayo. Potted meat and Vienna sausage sandwiches too. Oh yeah, and tuna packed in oil! Why did those nutritionists have to go mess things up for us? I know, right?! *lol* My son is 2 and he had spam for the first time yesterday and LOVED it!! Love this post Brittany! I love your down to earth simple approach to life, your love for family and living within your means. I have been a reader for about 3 years now and always look forward to Va Voom Vintage. To be honest, I don't like Spam but will certainly retry with this recipe! My husband will probably love it. Don't you just love those 50s recipes in the womens magazines? They are so economical too. Thank you so much, April! If anything, try the banana fritters, They get all melty and warm inside and its like warm banana pudding! I'm really enjoying all of these recipes. Last night, I made a pie with ground beef as the crust, filled with rice, cheese, onions and green bell peppers. The crust was so typically kitschy and strange but it was yummy!! Sounds so good. I have a bunch of 1950s magazines with a lot of recipes in them. I have tried several, and they were yummy! Very inexpensive to make with leftovers for lunch or another dinner. I have read how the average housewife needed to budget the family money back then. They ate good meals though, and the family looked well taken care of. You give all your readers a piece of that in your awesome blog! XOXO! I love spam! It is pretty consistent in our breakfasts. We eat spam sandwhiches occasionally. 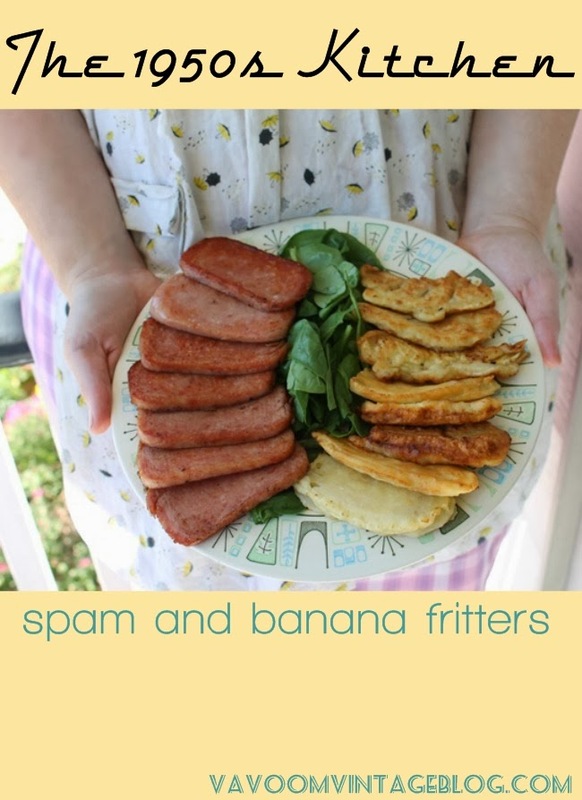 But, these banana fritters with spam sounds great.Will try it. Love fried Spam! And, with banana fritters??!!! Sounds too awesome! I'll have to try this! I know spam gets a bad rap as a weird retro food but it still has a place in the world. My husband loves the readymade spam fritters from the supermarket. I loved Spam fritters as a kid, but can't eat them now. I used to love turkey SPAM but haven't had it in years and I'm not even sure it is still made. The banana fritters sound like they'd be good cooked with bacon grease in lieu of SPAM. We always used to eat SPAM when we'd go camping. ;) Great childhood memories! This looks delicious! I'm thinkin' I'm gonna have to try it out! I lived with my grandparents, and we always had Spam sandwiches on road trips. On these trips, my grandmother had a tote bag that contained apples, a Rada paring knife in a leather holder, small bottle of French's mustard, a few cans of Spam, a loaf of bread and flimsy paper plates. My grandfather would drive, and she would make these sandwiches on her lap, in the car! Great memories!